You can't see it very well on the photo because I used three little rhinestones to build the body of the butterfly. Unfortunately, they cover up the part where the paper actually is not cut. These summer DPs are from the «Family Ties» paper pad by Pebbles. I heat embossed the swirl from Mama Elephant's «So Breezy» stamp set in «Liquid Platinum». The sentiment is from Papertrey Ink and I heat embossed it in white. To finish my card I added some sparkly sequins from Pretty Pink Posh. If you have the same die and get inspired by our challenge, feel free to play it with us! Leave a direct link to your project in the comment field below (No back links, please! It will be funnier to see new creations!). You can also upload your cards to our Same but different challenge Flickr gallery! Thanks to Stéphanie for joining! Hallo, liebe Anja! Eine sehr hübsche Karte! Mir gefällt es unheimlich gut, wie du den Schmetterling hinterlegt hast. Das gibt der Karte gleich das gewisse Etwas. ...und ausserdem wollte ich ja auch noch kommentieren, bevor ich duschen gehe!!!!!!!!!!!! *LACH* Deine Karte ist so "sonnig"! Sie ist wunderschön und die Ähnlichkeiten sind echt wahnsinnig! Es ist wirklich spannend mit dir! Gute Nacht und liebe Grüsse. Lovely... 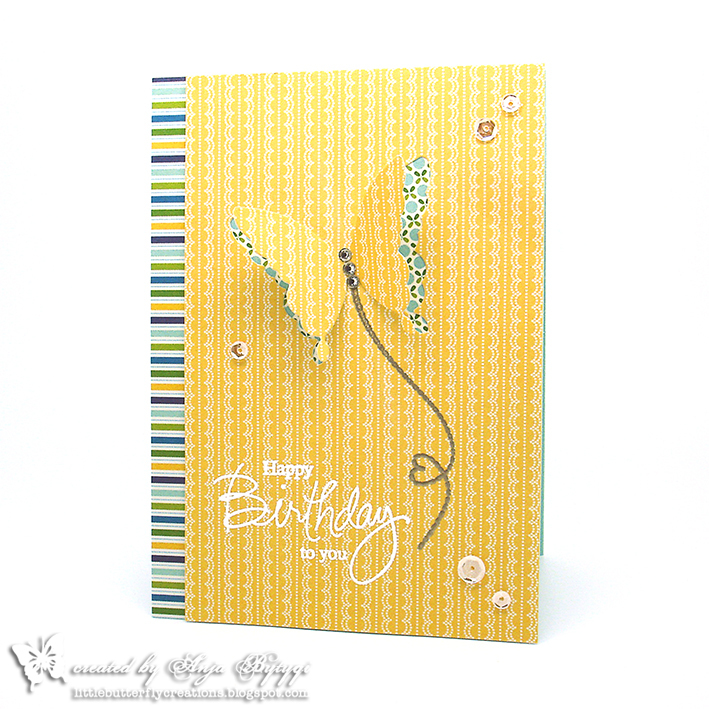 I so enjoy using butterfly dies in my cards do many wonderful ideas. Your design is absolutely brilliant Anja. I love how you pulled up the wings and love that flight path. So elegant and brilliant. The partial die cut technique is so cool. You used great papers to get the layering effect. Sweet as can be Anja. Hugs!